GOWANUS — When a new employee at the custom metal manufacturer Architectural Grille is stumped by a tricky welding job, there's a quick way to solve the problem — ask one of the company's veteran workers. "It happens every day," said Architectural Grille president Stephen Giumenta. 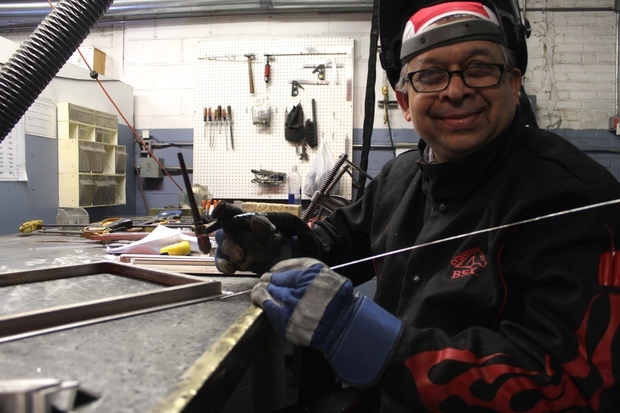 "The more experienced welder will come in and say, 'No, you have to do it this way.'" Architectural Grille's oldest employee is 70 and many workers are in their 50s and 60s. These workers are the company's backbone, Giumenta said. Many possess metalworking skills that are in short supply in today's workforce because schools no longer teach them. The 70-year-old family-owned company, which makes grilles for heating and air conditioning vents, is one of many small businesses citywide that turn to older employees to solve staffing needs. A recently released guide from the Robert N. Butler Columbia Aging Center at Columbia University gives tips on how other businesses can follow Architectural Grille's example. The Age Smart Industry Guide comes as small companies make up 99 percent of the city's businesses, according to the guide's authors. Many operate without human resources departments and struggle to fill empty positions. Meanwhile, New York City has 700,000 workers over 55, "plus many more who want or need to work well past the traditional age of retirement,” the guide’s authors said in a statement. At Architectural Grille, which was featured in the Age Smart Industry Guide, seasoned workers are valued for a variety of reasons, Giumenta said. Among the office staff, veteran employees are focused, organized and detail-oriented. One major reason: they're not distracted by social media and cell phones. "They're not worried about taking a selfie," Giumenta said. The presence of tenured employees also helps newer employees see that there's a future with the business if they want it. "It shows longevity, so it's good for company morale," Giumenta said. Senior employees with skills and experience are a "hot commodity" in danger of being poached by other businesses, Giumenta said. To hang on to them, Architectural Grille offers benefits such as a 401(k) plan. ► Modify work assignments or environments as workers age. At Rosenwach Tank in Long Island City, workers who can no longer do the manual labor involved in building the company's water tanks become inspectors. ► Create a family environment. At Bridge Cleaners & Tailors in Downtown Brooklyn, employees bring home-cooked dishes to share for lunch, and when one tailor's house burned down, everyone chipped in money. ► Capture valuable skills and knowledge before and after people retire. At Little Wolf Cabinet Shop on the Upper East Side, a valued older cabinetmaker was ready to retire, but the owner convinced him to stay for one more year, which he spent teaching a younger employee his tricks.